If I didn't live in San Diego, where would I move? I play this game a lot. When I retire, where will I move? I want to travel more, yet trading the awesome climate of Southern California for central Europe or Southeast Asia is a tough trade. I've gotten too accustomed to not caring about the weather report. There's little I miss about living in colder climates. I do miss the changing of the trees in autumn ... but I don't miss raking leaves! I took this photo late in December 1998 in one of the garden escapes in Tokyo. I remember the air was biting that day, my cheeks rosy, my lips beginning to chap. 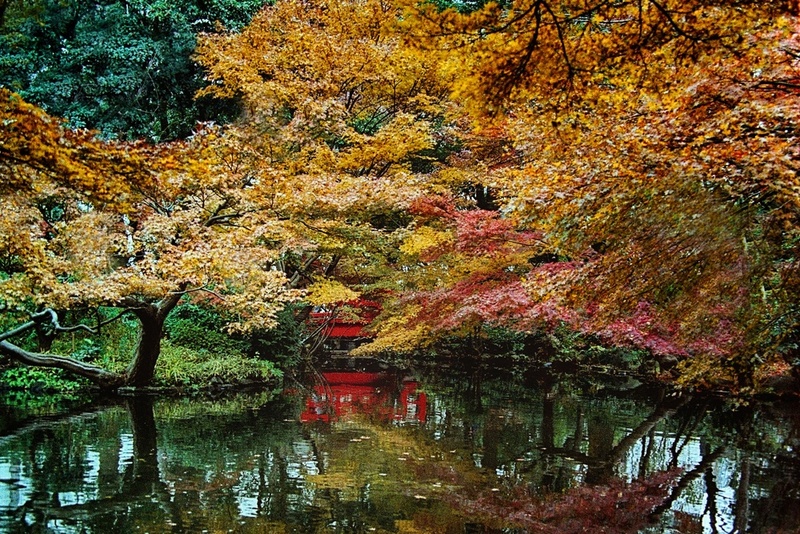 Yet the trees hung fast to their autumn colors, casting calm reflections in the water. I've enjoyed my visits to Japan over the years, but I'm not sure I'd live there. It gets too cold for me in the winter. The thicker skin I had when living on the East Coast childhood is long gone.